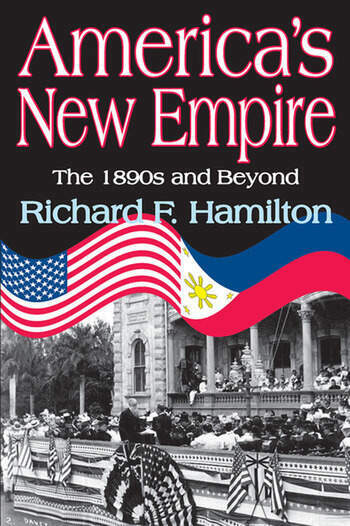 In this volume, Hamilton deals with some of the antecedents and the outcome of the Spanish-American war, specifically, the acquisition of an American empire. It critiques the "progressive" view of those events, questioning the notion that businessmen (and compliant politicians) aggressively sought new markets, particularly those of Asia. Hamilton shows that United States' exports continued to go, predominantly, to the major European nations. The progressive tradition has focused on empire, specifically on the Philippines depicted as a stepping stone to the China market. Hamilton shows that the Asian market remained minuscule in the following decades, and that other historical works have neglected the most important change in the nation's trade pattern, the growth of the Canada market, which two decades after the 1898 war, became the United States' largest foreign market. The book begins with a review and criticism of the basic assumptions of the progressive framework. These are, first, that the nation is ruled by big business (political leaders being compliant co-workers). Second, that those businessmen are zealous profit seekers. And third, that they are well-informed rational decision-makers. A further underlying assumption is that the economy was not functioning well in the 1890s and that a need for new markets was recognized as an urgent necessity, so that big business, accordingly, demanded world power and empire. Each of these assumptions, pivotal elements in the dominant progressive tradition in historical writing, is challenged, with an alternative viewpoint presented. Hamilton presents a different, more complex view of the events following the Spanish-American War. The class-dominance theory is not supported. The alternative argued here, elitism, proves appropriate and more useful. This review and assessment of arguments about American expansion in the 1890s adds much to the literature of the period.